Teachers conduct a daily Lindamood-Bell Seeing Stars PLC. Thanks this week go to director of technology Shaun Kohl, webmaster Elizabeth Ganache, and board-superintendent secretary Colleen Carroll for the extra effort they put in over the weekend attempting to get our student registration system back up and running. Unfortunately our Infinite Campus student management information system has been on the fritz since mid-day Friday. This has caused parents to be unable to pre-register their children online, and is most frustrating because the issue is our of our control (the problems are on Infinite Campus’s end). I very much appreciate how Shaun, Elizabeth, and Colleen have been doing all they can to help the folks at Infinite Campus understand just how important it is to get the system back up and running. On Tuesday I enjoyed attending and participating in a daily Professional Learning Community work session consisting of summer reading academy instructors. I am really impressed with the work our summer interventionists are doing while teaching students, and by opening themselves up each afternoon to discuss areas of Seeing Stars instruction they are not yet comfortable with. On Tuesday Cañon City High School SRO Steve Huskey was kind enough to share information about Colorado’s Safe 2 Tell school safety anonymous reporting system with our board of education and board meeting attendees. I appreciate the time he took to share this information, and I thank Officer Huskey for all he does to communicate this valuable system to our students and members of the community. Safe 2 Tell saves lives. On a final note, I want to thank Colleen Carrol for the great job she did planning for and conducting our back to school office staff development session. It is a sure sign that summer is fast coming to an end when we have all our key building people gather at the administration office to learn about expectations and to share information about important changes that will take place during the coming school year. Thanks Colleen for your hard work toward this endeavor! 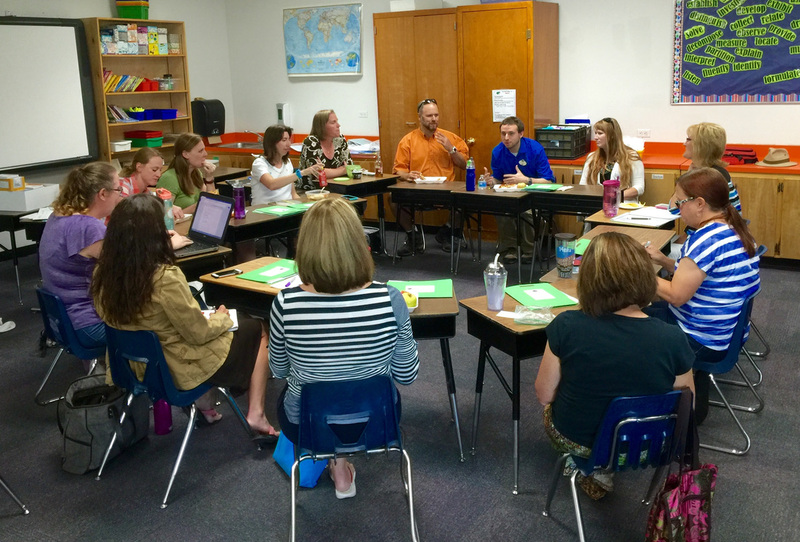 Key school personnel attend back to school training last week. It has come to my attention that some folks are questioning our use of district funds in light of the recent hirings of directors and literacy coaches. To clarify, the three director level positions we hired this spring were not an expansion of our administrative team. All were replacements and each (new CCHS principal Bill Summers, special services director Lynnette Steinhoff, and director of instruction Adam Hartman) was hired at a salary that was lower than their predecessor’s. In fact, as a result of this, during salary negotiations this year we were able to add more dollars to the pool of resources we allocated toward our classified salary package. There are also questions about why we hired five literacy coaches, and a district level literacy coordinator. The funds used to expand our instructional coaching staff in these areas were all allocated through recently acquired grants. Our three-year $900,000 Early Literacy grant was the main source of funding for these positions, and as with all grant funds it must be used to provide the services we promised through the application process. We have not expanded our administrative staff beyond the parameters of the extra dollars we have brought in as a result of successful grant applications this year. 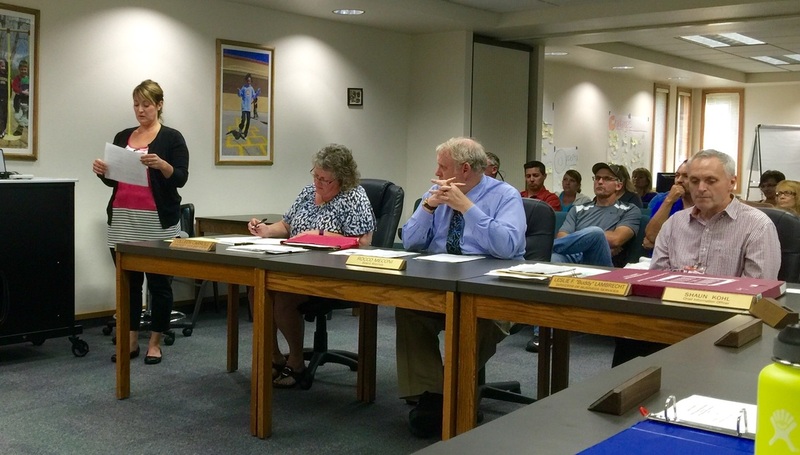 At Monday's board of education meeting information was shared about the overall facilities condition of the Cañon City School District. This presentation was attended by around 30 community members and the Cañon City Daily Record published an article on Tuesday sharing some of what was presented during an hour and a half long presentation and discussion. As a reminder, we publicized this meeting on the radio, in the newspaper, on social media, and through my weekly Echoes from Cañon publication, inviting all interested citizens to attend. In the past week we have noticed comments people have made on social media about our situation. Based on this I would like to help make some things more clear about our facilities situation in the school district. First, facilities experts estimate we currently have 12 million dollars in unmet building upkeep needs. Though many have voiced concerns that we are spending tax dollars unwisely, the fact is the operations dollars we receive each year have never been intended to maintain our buildings over long periods of time, and are certainly not intended to fund the construction of new ones. Every school building we have was built as the result of the community standing behind our schools and children by voting to approve a tax increase to build it. At this point in time each of our school buildings, except for the new Harrison K-8, has also been remodeled, upgraded, or repaired as a result of prior tax questions approved by the community. Additionally, as a result of the recent recession and the resulting reduction of funding to the district of an average of 3 million dollars per year, our staff members had not received a single experience raise in their salaries for 6 straight years. I know our people work their hearts out on behalf of our children. I believe that both they, and the children they serve, have a basic right to work and learn in a safe and secure environment. There were also many statements about our district schools being overcrowded . The reason the district is considering closing a school is because we, in fact, already have space for approximately 1,000 more students than we currently serve. This means we heat, cool, and maintain classroom space on an annual basis that is not currently being used. Some may argue this is not a wise expenditure of tax dollars. Additionally, we are also entertaining closing a facility and relocating students because we want to be able to compete for a Building Excellent Schools Today grant that would cover 65 percent of our current 12 million dollar facilities upkeep bill. This would leave the Fremont RE-1 taxpayers in a position where they only need to pay for around 4.2 million dollars of this 12 million dollar bill. I view the board considering this as thoughtful and effective financial stewardship on behalf of the district's taxpayers. The reason Washington Elementary is being considered for closure is because structural issues and other concerns we have identified would cause the district to invest 3.5 million dollars to repair it, and in the end the building would pretty much look exactly as it does now. This may turn out to be the best solution. However, I believe the board feels it would not be doing its duty if it did not consider all possibilities. Please understand the Washington building, without these structural repairs, has been deemed safe for the time being. However, we can not guarantee it will continue to be so longer than 5 years into the future if we do not attend to the needs that have been identified. I understand such conversations are not easy to hold. However, now is the time to consider what the future condition of our facilities will be. Historically, the Cañon City community prioritized the education of its children to the point that it voted to invest its property tax dollars by building four new elementary schools (replacements for Lincoln, a major upgrade of the old Harrison, a brand new school in McKinley, and yes, a replacement of the old Washington school) over a span of 3 years (1949 to 1952). Many of you probably went to these schools. Your parents and grandparents paid for them. But back then there was no BEST grant process to cover 65% of the costs. I have also noticed social media comments about how, if marijuana sales were legalized within Cañon City or Fremont County, we would somehow not have this facilities problem. The fact of the matter is the only way we would be able to take advantage of marijuana tax dollars, be the product sold here in town or anywhere in Colorado, is by successfully securing a BEST grant. That is where the dollars go that will eventually be distributed to schools. Unfortunately, we know we will not be awarded a BEST grant if we ask the state to support us in maintaining one more building than we truly need. As we move forward with this conversation we promise we’ll make decisions based on the following four interests. We will strive to implement an effective educational model for all our children, we will have a viable plan for the future use of any property related to a facility we might close, we will maintain our valued neighborhood schools if at all possible, and if changes have to be made we will carefully and thoughtfully transition any students who must be moved to a new school. One final bit of information on this. Should the board decide a building actually needs to be closed the timeline to do so would be as follows: Decision to do so made by November 1, 2016. BEST grant written to secure funding to address all outstanding facilities health and safety needs, and prepare space for displaced students, by March 1, 2017. Grant awarded (hopefully) by June 1, 2017. Election held to provide 35% of funding needed to finance the project by early November 2017. If the election is successful, finalized construction plans would be drawn up by the spring of 2018, construction would take place during the summer of 2018 and during the 18-19 school year. All upgrades would be completed and new attendance boundaries would be in place in time for the beginning of the 2019-20 school year. The board of education has asked us to present some possible facilities models and their potential costs at its August 8th meeting. I invite each of you to attend this, and future meetings, to learn more about the options that are being considered. On Monday we began back to school training with key people from our school buildings, I also worked on finalizing a facilities presentation for the board, and met with board president Larry Oddo over lunch. In the afternoon I attended an elementary principal meeting about our Early Literacy Grant, then participated in our board work session and regular meeting. On Tuesday I had a meeting with Fremont County Department of Human Services director Steve Clifton. I also attended a SAC meeting, a meeting with community partners, and a summer reading academy PLC. On Wednesday I worked on grant compliance, prepared for our all staff back to school event, and traveled to Breckenridge to attend a session of the Colorado Association of School Executives annual conference. I’returned to Cañon on Thursday evening, had breakfast with board director Shad Johnson on Friday, and completed a lot of office paperwork throughout the day. District Nurse Patricia Sallie presents information about changes to immunization requirements to the board of education. I’ll begin this week by touching base with RE-2 superintendent Rhonda Roberts first thing Monday morning. Later in the day I will bring new Cañon City Daily Record reporter Sarah Knuth to observe our Lindamood-Bell Summer Reading Academy. On Monday I’ll also observe the work our nutrition team is doing at their begging of school year boot camp, meet with CES principal Scott Morton about developing a rubric to measure his school’s success in teaching to the exploratory model, and then I’ll work with district literacy coordinator Gina Gallegos to prepare for and conduct a building leader PLC session on Monday afternoon. On Tuesday we have a superintendent advisory council meeting, I’ll meet with the employees at our district maintenance shop about budget issues, and then I’ll travel to Denver to chair the quarterly Colorado Safe School Resource Center board meeting. Wednesday brings our monthly admin office team meeting, meetings about budget items and grant implementation, a meeting with our district nurse Patricia Sallie, and then I’ll travel back to Denver to participate in my first event with other members of Colorado’s governor appointed Early Childhood Leadership Council. On Thursday I have a meting with PCC folks about the future of our high school welding program followed by an administration leadership team meeting in the afternoon. I have a light schedule next Friday including a monthly touching base meeting with director of special services Lynnette Steinhoff, and including a meeting with Dr. Lana Carter from the PCC Fremont Campus and CCHS principal Bill Summers.